NASA let Facebook-owned Instagram sneak peek Pluto photos and Google celebrates the partnership of NASA and Facebook’s Instagram sneak-peek exploratory Pluto photo with a lovely animated doodle. Pluto’s sneak peek photo on Instagram marks the first time NASA has given social media the first shot, sneak peek to its space exploratory photo. NASA’s New Horizons spacecraft traveled for 9 years, 3 billion miles, at 14km per second (roughly 1.79 miles per second) around Pluto capturing the very first image today (July 13) at 4 p.m. (E.D.T.) at 476,000 miles from Pluto’s surface. The closest and most detailed image was photographed later this morning at 7:49 a.m.
NASA’s live briefing on NASA TV began 8 a.m. today at NASA TV, and the high resolution photo will be posted at NASA.gov with more coverage on NASA TV throughout the day. 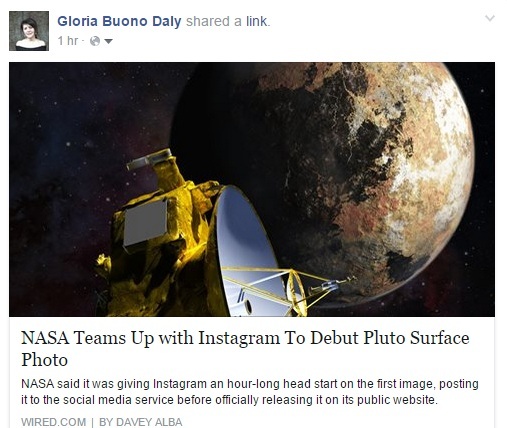 NASA also agreed to give Facebook's Instagram, which currently has 300 million users, a head start by allowing it to post the first image 7.a.m. before official release. The NASA Instagram is very popular and has over 3.5 million followers. For decades has been much debate and challenge as to the size of Pluto due to many factors including Pluto's atmosphere. With NASA’s latest New Horizons spacecraft mission the size of Pluto is estimated at 1,473 miles (2,370 kilometers) in diameter, somewhat larger than many prior estimates. Pluto is the second-most massive direct orbit of the Sun in the Solar System and ninth largest (tenth-most massive) known object directly orbiting the Sun. Eight planets orbit the sun, listed in order closest to the Sun: Mercury,Venus, Earth, Mars, Jupiter, Saturn, Uranus, Neptune. Once classified as a planet, Pluto, is now classified as a dwarf planet or plutoid. As of 8:25 a.m, there are currently over 90.5K likes and over 3,500 comments on NASA’s Instagram. 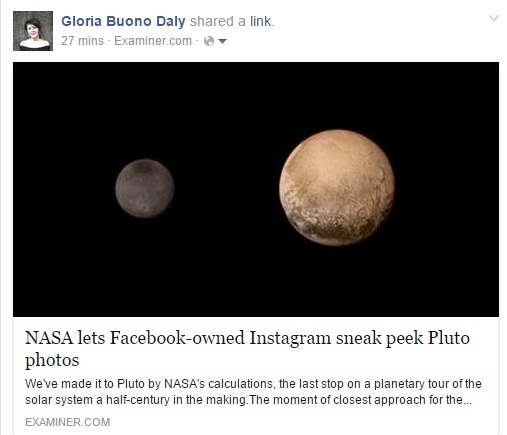 • The New Horizons Pluto mission is a big deal. Here are 7 reasons why.